If you'd like to put the Internet on your TV again, or if you're looking for a low-cost replacement for your old desktop computer, the Chromebox could be your answer. It's the set-top box version of the popular Chromebook computer. It works exactly the same way, except that it's in a little box that connects to your TV or monitor, rather than being a laptop computer. I've used one for six months, and here's Dudette's Chromebox Review which will tell you what I think of it and has links for videos to show you more! And if you need more than that, check out A Selection of Chromebox Reviews to see what others have to say about it (with videos). Because the Chromebox not an "all in one" you'll need a few extra things to set it up. Here's your list of the items you'll need, and the links to buy them on Amazon. Chromeboxes are currently made by ASUS, HP and Acer, with some other manufacturers (like Dell and Samsung) now coming on board. Generally, you'll find the ones you want in the $140 to $160 price range for the first models (Celeron processors with 2GB of memory), and $180 to $230 models with faster processors and/or more memory. Here are several for you to consider. Here's a link to all of the Chromeboxes on Amazon. .
1 . Look at the specifications when you're comparing units. All of the features are the same with the exception of manufacturer, CPU (how fast and what type), memory, and the color of the box. 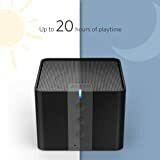 If you are just going to use it for email, web surfing, the games you play now, watching video, and Facebook, even the cheapest Chromebox will serve the purpose. 2. Don't buy a "bundle" unless it is exactly what you would buy individually. The Chromebox doesn't come with a keyboard and mouse, and some bundles being offered jack up the price to include the cheapest wired ones they can get away with (you don't want a wired keyboard and mouse unless it will be a desktop machine). Also, don't assume the bundle comes with everything -- if a monitor is bundled with the Chromebox, you'll still need a keyboard and mouse. 3. Look at all the offerings before you make up your mind, and check to see who sells and ships them. Third parties sometimes have higher prices, or very low prices and then expensive shipping. If Amazon sells it, shipping will be free since it's over $25. Your service and ability to return will be better if you buy from Amazon. 4. If you're looking for a Chromebox, make sure it is Chromebox. When you search on Amazon, it will return items that it thinks are similar, even if you don't. ASUS also has a Windows 8.1 PC that looks like a Chromebox, so unless you want a Windows machine, read the specs to make sure it's the Chromebox you're ordering. If you are going to use your Chromebox as a desktop computer, and you already have a USB keyboard and mouse, they will work with your Chromebox. There are 4 USB ports on the Chromebox and you can just plug them in. I still personally prefer (and recommend) a wireless keyboard and mouse, and the one below just uses a single USB port because the receiver serves both devices. Be sure to look around when you search for keyboards, and compare the model numbers and prices. Sometimes pricing doesn't seem to make sense! For example, this Logitech MK270 is the keyboard and mouse both, using the single USB receiver. If you're not paying attention, Logitech is perfectly happy to sell you exactly the same keyboard without a mouse as the K270 for about $15 more! 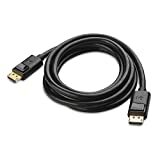 If you are going to connect the Chromebox to a HDTV, or you're using a late-model flat-screen computer monitor that has HDMI connectors, you'll want to order a cable unless you have an extra one lying around. 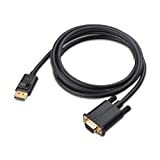 Of course, you can pick up an HDMI cable at your local BestBuy or RadioShack, but they are much cheaper and just as good if you order the Amazon basic HDMI cable. 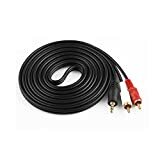 The HDMI cable also will carry the audio signal to the TV or monitor so that you can use its built-in speakers. Many late-model flat-screen computer monitors use a connector called a DisplayPort. The Chromeboxes all have DisplayPort connectors as well, so you'll just need the cable. Like HDMI, DisplayPort also carries the audio so you can use the monitor speakers. 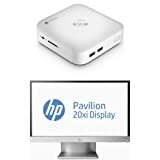 If you're connecting to an existing, late-model (flat screen) computer monitor that doesn't have HDMI or DisplayPort, but that can support at least 1280 x 720 resolution (720p), or preferably much better, you can still connect the Chromebox to it. Look at its connectors on the back to see what it needs. The type of display port is usually marked above the plug on the monitor. If the monitor already has a cord, you'll buy an adapter for it. If the monitor uses DVI, you can get a cable that will convert the DisplayPort signal to DVI. DVI does not carry the audio, however, so you will need an audio adapter as well. If the monitor uses analog VGA, you can get a cable that will convert the DisplayPort signal to VGA. VGA does not carry the audio either, so you will need an audio adapter with this one too. If your monitor already has a cable, you can just get the smaller DisplayPort to VGA adapter; if not, get the cable. The Chromebox has a single speaker/mike jack on the front. 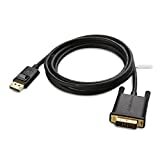 If you're using an HDTV, or to a computer monitor with HDMI or DisplayPort, it's no problem. The audio will be carried over the HDMI or DisplayPort cable and will be output through the TV or monitor speakers. Otherwise, you have these choices. You can connect wirelessly to Bluetooth speakers, which is what I do with my Chromebook. 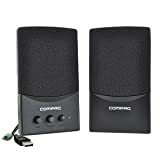 Or you can purchase some computer speakers that connect via the USB plug. Or you can plug an adapter (splitter) into the mike-headphone jack to split them into separate jacks. Then you can plug them into your stereo or your TV ... or into powered computer speakers. Here are two very nice ones. I use the Anker in my bedroom with my iPad, and have another on my desk for my Chromebook. The Oontz by Cambridge SoundWorks is also a well-reviewed little speaker in the same price range. One thing to watch -- sometimes the same speaker in different colors can have very different prices, but the sound that comes out is the same. By the way, click the links to check the actual prices on Amazon. For some reason, their feed to this page seems to be showing list prices for the Bluetooth speakers, instead of actual prices which are about $30 less. There also are Bluetooth headphones, and Bluetooth headsets with headphones and a mic, if you'd prefer to keep the audio to yourself. 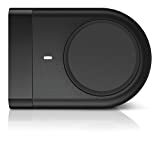 Here's a link to the page of Bluetooth Speakers at Amazon and also to Bluetooth Headphones at Amazon. If you decide you're going to go with wired speakers, the easy way is to use speakers that connect via USB. Here's a nice pair to choose from that have gotten good reviews. You're not going to get room-filling sound from USB speakers, the way you would from a TV or stereo amplifier, because they draw their power from the Chromebook over the USB connection. For that, you'll need speakers with an amplifier and their own power supply -- the TV, or the stereo. And for that, you'll need the splitter adapter I mentioned to turn the audio output into separate jacks. 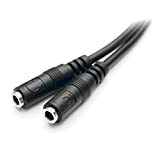 Then you will need miniplug stereo audio cable to plug into amplified computer speakers, or if you want to plug them into your stereo amplifier or TV, you'll then need a stereo mini to RCA cable. If you want wired sound instead of Bluetooth, but don't already have a stereo or computer speakers you want to use, then save yourself the hassle and some the USB speakers. Remember that the Chromebox and the Chromebook work exactly the same, except one is a set-top box and the other is a laptop computer. Since the manuals that come with them are just booklets to get you started, I really recommend My Google Chromebook which will tell you everything. If you prefer the "for Dummies series," here's also Chromebook for Dummies. 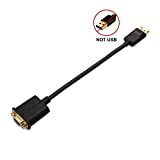 If you already have a flat-screen TV with an HDMI connector, you just need a Chromebox, a keyboard/mouse or keyboard with a touchpad, and an HDMI cable to connect them. You'll connect to the Internet either by a network cable (if you're replacing a computer that had one, you can use its cable to connect) or by WiFi. You can get everything you need to be online for less than $200. You only need the other things we talk about if you're using a computer monitor that doesn't have an HDMI connector. That's it! And remember, once your Chromebox is set up, using it is exactly like using a Chromebook. So everything we tell you for the Chromebook is for you, too. And if you have questions, feel free to post them in the comments and we'll try to answer. If you're a Games4TV members with Talk4TV and you don't see the comment block below, log in (at the bottom of the page) and it will appear. If you don't have your Talk4TV turned on, you can do it from the Games4TV front page -- it's free for all active Games4TV members. And if you're not a Games4TV member yet, why not join us?